I haven’t made it to the bridge on the Drina (yet), both literally and metaphorically speaking. I simply don’t feel like I have good enough grip of the Balkan history and culture to comment meaningfully on the subject of what happened in the region in the last two decades (but apparently Angelina Jolie does). So instead I’d like to share a few impressions of the part of the Balkans I do know, Belgrade. Like the bridge on the Drina, Belgrade’s bridges have their own share of linking (or dividing – depends on a point of view) countries and cultures. This is where the Sava and Danube rivers meet. And this is where the Ottoman and Austro-Hungarian Empires coexisted and clashed for ages. Belgrade’s long-standing history as a defensive outpost is clearly on display when you cross the Sava river driving from the airport. Two things stand out: the statue of Serbian Pobednik, or Victor, and the massive wall of Belgrade Fortress perched on the hill. Belgrade Fortress is a citadel with the history dating back to a Roman settlement and the old urban core of the city that for centuries was contained within its walls. These gleaming stone walls is what gave Belgrade its name: Beograd or “white city” in Serbian. 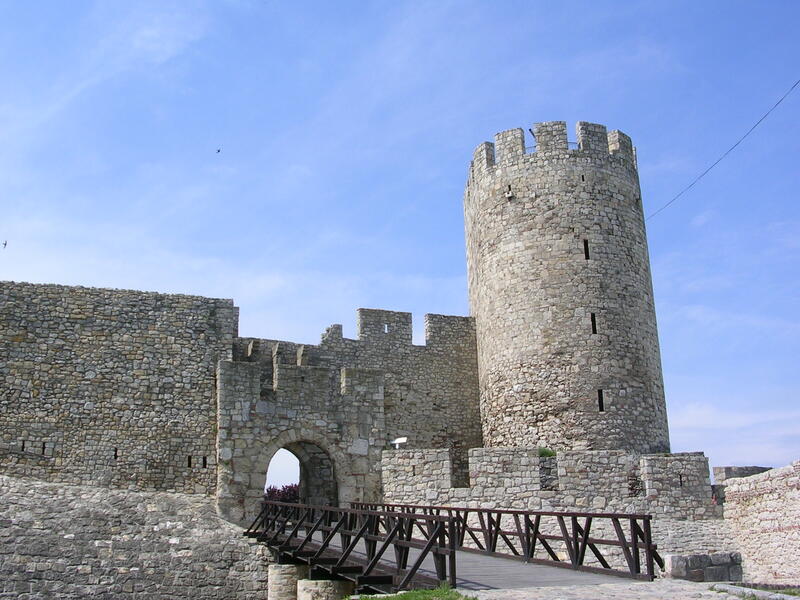 Different parts of the fortress were built (and rebuilt) at different times given that Belgrade was destroyed and reconstructed over 40 times in its long, tumultuous history. 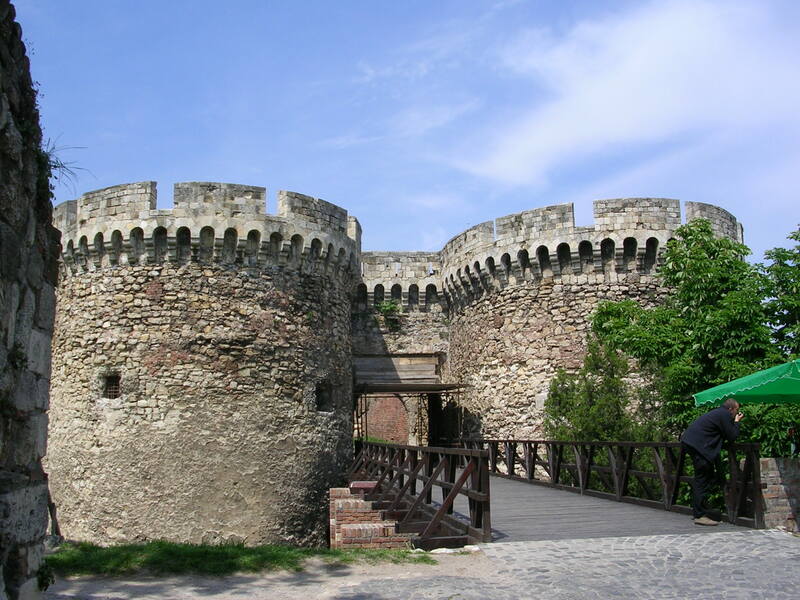 The fortress is located in the expansive Kalemegdan Park (Kalemegdan = kale-fortress + meydan-battleground in Turkish) which is a beloved chill-out destination for the locals. On a sunny day the entire families come for a stroll, with all age groups represented, taking in the relaxing atmosphere of this green urban oasis and enjoy great city views. 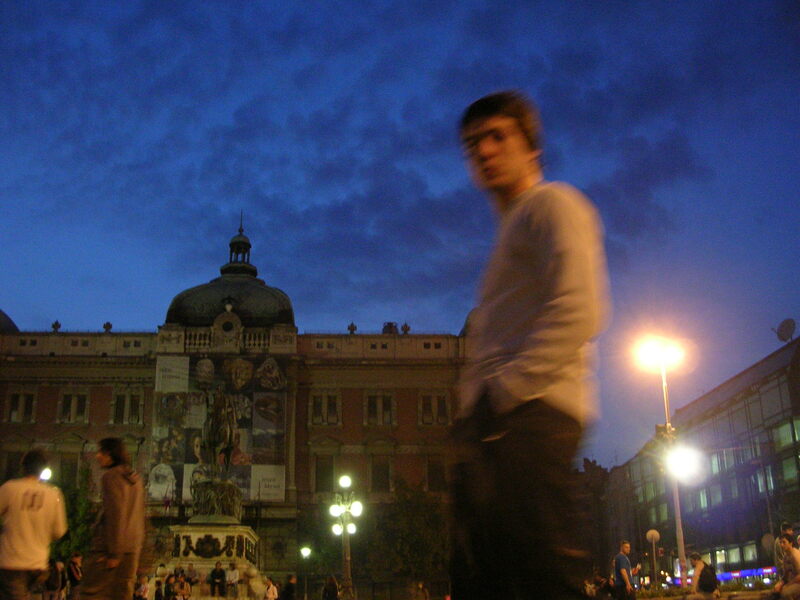 Before I went to Belgrade my image of Serbia was overwhelmingly negative, tied to violence and destruction of the 1990s. Also in popular culture Serbia simply gets a bad rep. Think of your typical Hollywood crime flick – if it features a brutal European gangster, it’s a 50/50 chance he’s either Serbian or Russian. Finally, having grown up under the communism with its many appalling architectural deformities and general urban drabness, I was picturing a gray, cold, worn and generally uninviting city. I was definitely in for a positive surprise. Yup, this is Belgrade. Gorgeous squares, lively streets, and a hip-looking guy who walked into my frame =) This was definitely the best part of my time there – just walking around and looking for unexpected finds. Definitely it’s not all new and hip. But it’s the mixture of the new and the old like the one found here that I always appreciate. And Belgrade is very pedestrian friendly. The best place to start is Knez Mihailova street, pedestrian-only shopper’s paradise. It especially comes to life at night complete with throngs of foodies on a restaurant crawl and street musicians. 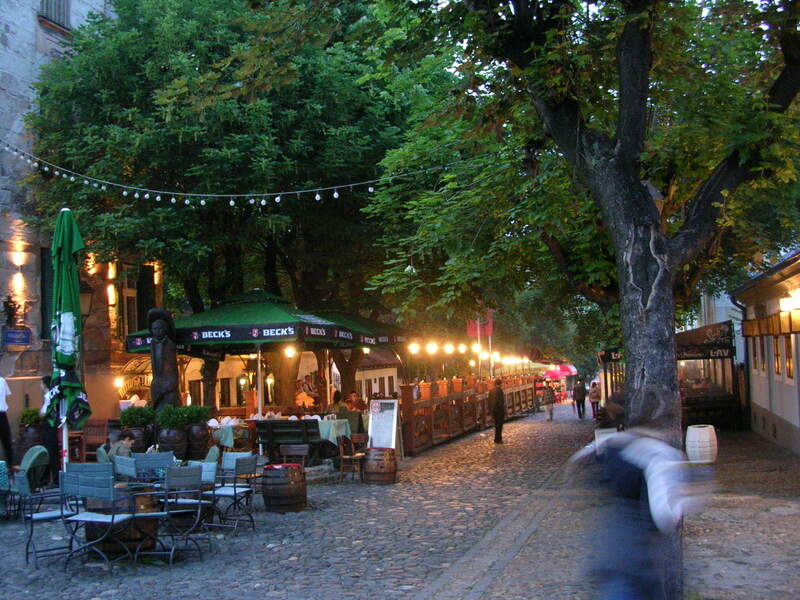 A great evening destination is also nearby Skadarska street, the heart of a former Gypsy quarter and today a favorite hangout spot for locals and tourists alike. This short, steep, and curved cobblestone street is really more like an intimate alley with awesome cafés, restaurants, and art exhibits. My favorite spot: the outside sitting area of Zlatni Bokal restaurant, enjoying ćevapčići (yes, if you can pronounce it, you must know a Slavic language =), traditional grilled minced meat dish. 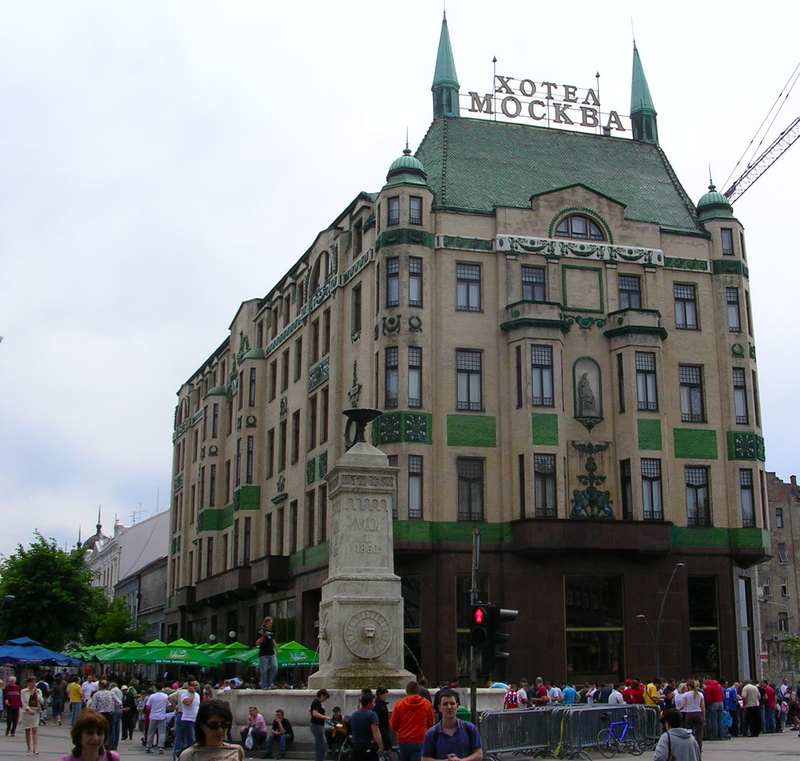 Any walk around Belgrade should also include Terazije, a central street with some impressive architecture like the 1906 Hotel Moskva, built in 1906, with its stunning ceramic tile facade. It’s a great destination for desserts by the way. 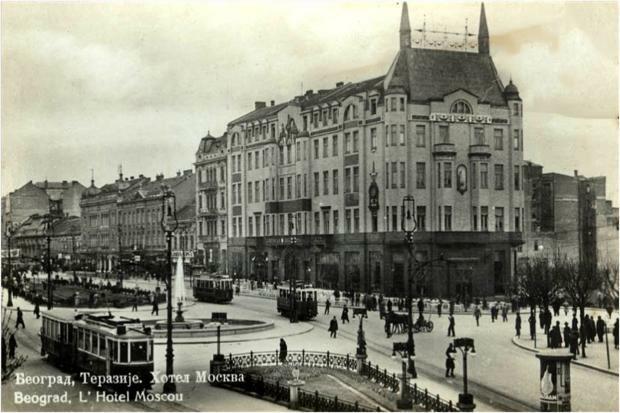 One of the most famous structures in Belgrade, Hotel Moskva has been a favorite place of the cultural elites including Ivo Andrić who regularly frequented the restaurant. The hotel has hosted many international celebrities over the years. Walking down Terazije, you can sample the wealth of local cuisine. Snack-wise one thing that stuck in my memory was burek, traditional Turkish pastry filled with meet, cheese, and vegetables. But I have to admit I remember it less for its taste than the name. “Burek” is a common name for a dog in Polish – not that this has anything to do with the type of meet used in burek, just a mnemonic device =) From Terazije you also get an amazing view of the Cathedral of Saint Sava, the largest Orthodox church in the Balkans. The idea to build it dates back to 1895 but let’s just say it took a while to implement. When I was there a few years ago, I walked into the church with anticipation of the usual opulence of an Orthodox temple only to be sorely disappointed: the place was totally empty inside, the interior still under construction. I hear it’s been finished by now so that’s definitely one reason to go back. Back to the bridge theme… When in Belgrade, don’t miss an opportunity to cross the Sava river to the western district of Zemun. 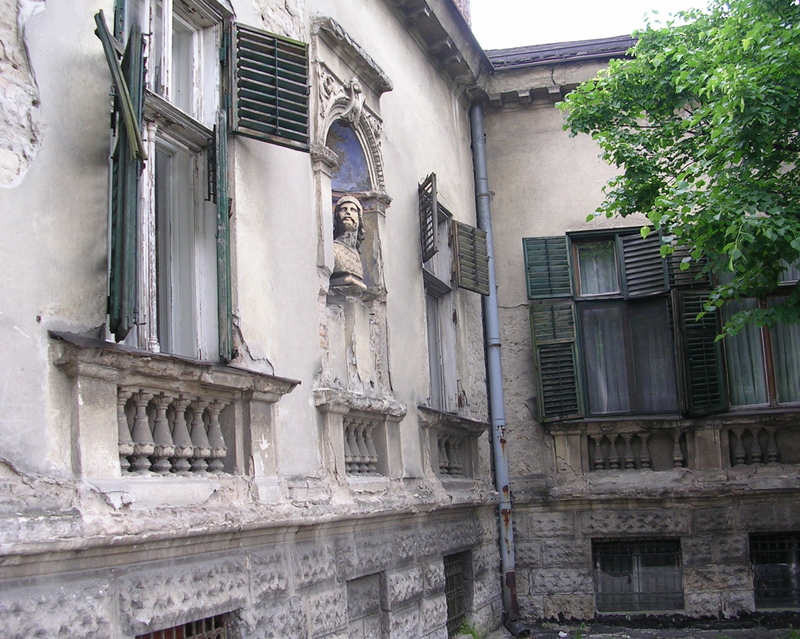 Historically, Zemun was its own town that didn’t become a part of Belgrade until after WWII. But for a long time it was more than a separate town: it was in a different country. Belgrade proper was conquered by the Ottomans Turks in 1521 and remained a part in Ottoman hands until the 19th century, punctuated by several Habsburg intrusions. The Treaty of Belgrade signed in 1739 ended one of them when the Ottomans and the Habsburgs set the rivers Sava and Danube as demarkation lines between the two. That meant Zemun became a part of the Austro-Hungarian Empire and stayed that way until 1918 when it became a part of Yugoslavia. Going to Zemun is like stepping back in time. It has none of Belgrade’s urban bustle. In fact, it feels more like a village probably the same way it felt a hundred years ago. 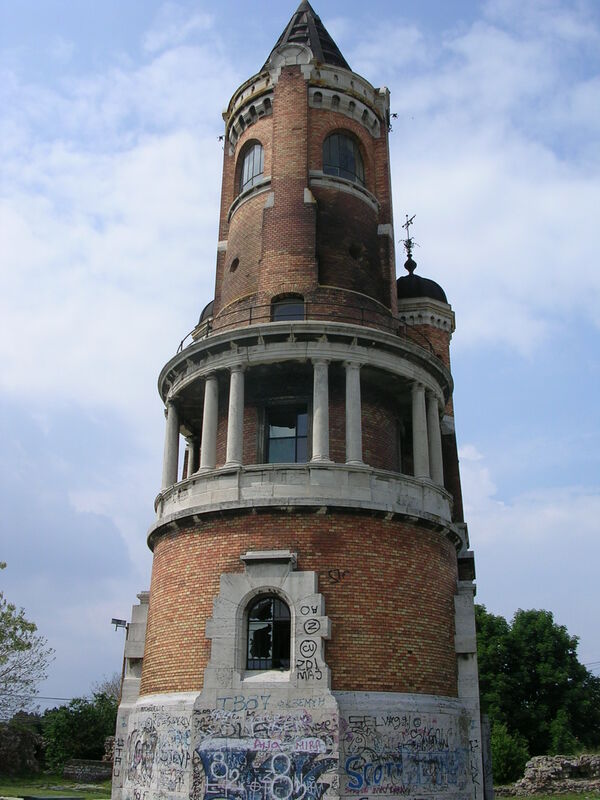 The focal point of the town is Gardoš tower (also called the tower of Janos Hunyadi) built in 1896 to celebrate a thousand years of Hungarian settlement in the area given that Zemun at the time was the southernmost city in Austria-Hungary. Gardoš looks a bit sad these days, its base covered in graffiti. 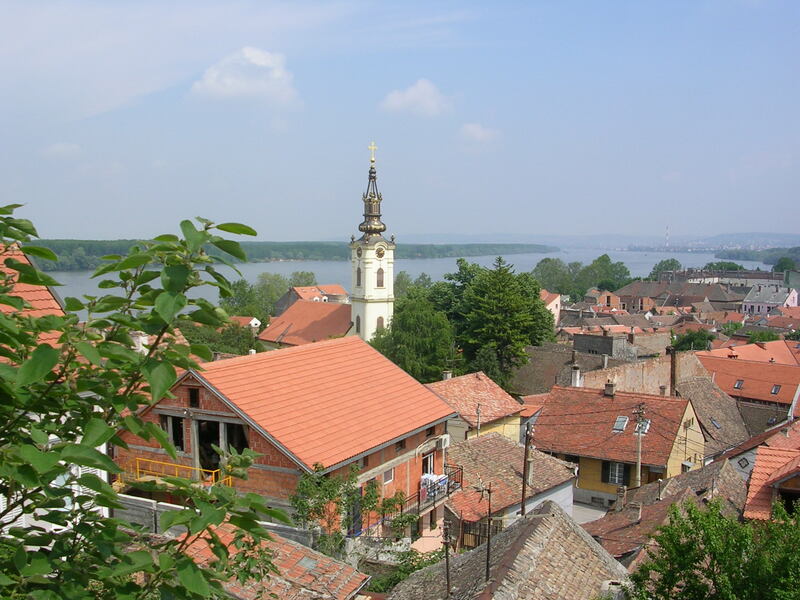 But seeing it up close is definitely worth the climb up Zemun’s narrow streets: a view from the top. 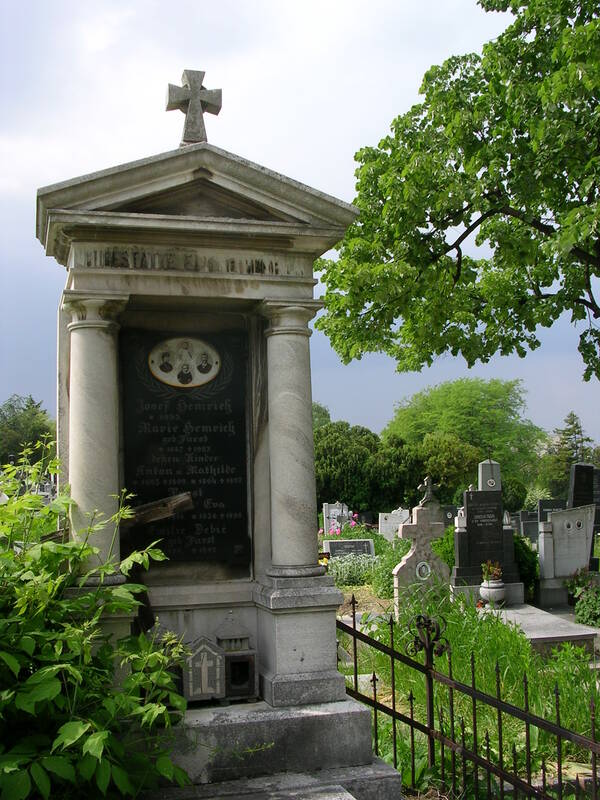 Another place I found to be very special in Zemun is its historic cemetery. Symbolically, it feels like a burial place of old, Austro-Hungarian Zemun itself. Among newer graves with Slavic names are many older ones with inscriptions in German, silently telling the stories of Zemun as it once was and the Balkans as they once were. Wondeful! So many of your photos remind me of my time in the Balkans. 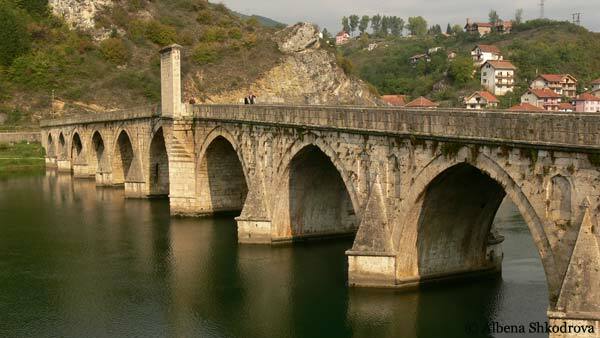 Beograd is a great city and the bridge in Visegrad is really nice. I was glad I had read Andric’s book before seeing the bridge. And I hope you get to spend more time in the Balkans and enjoy the hospitality of some of the friendliest people I have ever met! Thank you so much! What other cities in the region would you recommend from your Balkan travels? Dubrovnik – and of course Visegrad – are on my list. What were some of the highlights for you? Good post – I enjoyed reading it. I have studied Balkan history and travelled to Slovenia, Craotia, Bosnia and Montenegro and I still find the region confusing and difficult to understand. The highlight for me has to be a visit to Mostar and a viewing of the rebuilt Stari Most bridge! Thank you so much! I feel like I only just touched the surface during my brief visit. Definitely want to come back for a more in-depth taste of the Balkans and Mostar is on my list! I was in Belgrade many years ago and was left with the impression of shades of grey. At that time almost 40 years ago there seemed to be no light, no laughter, no music, just all the shades of grey. You should come back – it’s definitely more lively and colorful now!